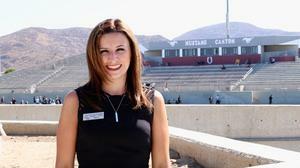 Shannyn Cahoon is beginning her first year as the West Valley High School Principal. Her predecessor, Dr. Janice Jones, was promoted to Director of English Learners and Categorical Programs. Cahoon came to West Valley after serving in Temecula Unified and Jurupa Unified. She said she is thankful to be able to lead West Valley High School as they work to become an International Baccalaureate (IB) school. In her previous position, she helped support the Advanced Placement (AP) and IB programs and is excited to continue that work to support the students at West Valley. Cahoon said students and staff can expect her to be a very visible Principal. She enjoys being in classrooms and working with staff to support the various needs of students on campus. She said she likes to engage with students during lunch and dismissal and hear first-hand of their experience and ways in which staff can make it better. Cahoon said she will use this first year to learn how the school operates. She plans on working with staff to provide a culture that is focused on critical thinking and a growth-mindset. Cahoon said she has been impressed with the staff’s student-centered focus and is excited to provide additional support to ensure they can reach the common goal of increased student achievement. Congrats and welcome to the team, Principal Cahoon! We look forward to the great things that are sure to come from the students of West Valley High School!